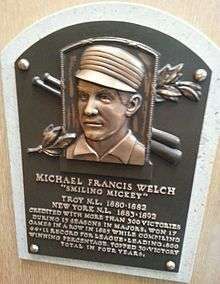 Michael Francis Welch (July 4, 1859 – July 30, 1941), nicknamed "Smiling Mickey", was a Major League Baseball pitcher. He was the third pitcher to accumulate 300 career victories. Welch was born in Brooklyn, New York, and played 13 seasons in the major leagues, three with the Troy Trojans, and 10 with the New York Gothams/Giants. He was very successful with an effective curveball, a change of pace, and a version of the screwball. During his 13 major league seasons, he posted 20 or more wins nine times, seven in succession. Welch was born Michael Francis Walsh in Brooklyn, New York, to Irish immigrant parents John and Mary Walsh. He later adopted the last name Welch. The name change may have been spurred by a sportswriter's mistaken recording of the name in a box score. The new last name may have distinguished him from the high number of men in Brooklyn at the time named Michael Walsh. Off the baseball field, Welch used his birth name throughout his life. When he was growing up in the Williamsburg section of Brooklyn, baseball was the popular sport among Irish children. Welch recalled that he had to learn unique baseball skills because of his small size; he depended on strong control of his pitches, a good curveball and change-of-pace, and a studious approach to opposing batters. Welch made his major league debut in 1880, winning 34 games for the Troy Trojans. On July 6, 1880, he pitched a one-hitter against the Cleveland Blues. Welch's totals dipped during the following two seasons, when he began to split starts with Tim Keefe, who also went on to win more than 300 games. The duo would only enjoy moderate success over the course of three seasons with the Trojans, a team that never finished higher than fourth in the National League during its four season run. After the Trojans disbanded after the 1882 season, the New York Gothams replaced them, taking many of the Troy players, including Welch. He resumed a heavy workload in 1883, throwing 426 innings in 54 games. This time he split pitching duties with John Montgomery Ward in what turned out to be Ward's final season as a regular pitcher. In 1884, he went 39-21 with 345 strikeouts and a 2.50 ERA. 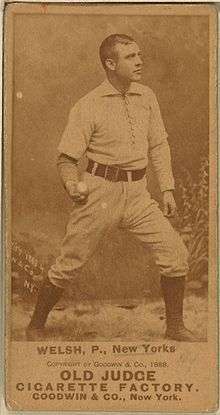 Welch holds the record for most consecutive batters struck out to begin a game, with 9, set on August 28, 1884. The record was not recognized for many years because of confusion over a dropped third strike. In the third inning of that game, a third strike was dropped by New York catcher Bill Loughran. As a result, that batter safely reached first base. Though modern scorekeeping would credit a pitcher with a strikeout in this situation, such an event was not always recorded as a strikeout by sportswriters of that era. Baseball historian Harry Simmons helped Welch to receive official recognition of the feat in the 1940s. Tom Seaver struck out ten consecutive batters in 1970, but no pitcher has done that at the beginning of a game. Joe Cowley of the 1986 Chicago White Sox has come the closest to Welch's record, striking out the first seven batters of a game. In 1885, when he went 44-11 with 258 strikeouts and a 1.66 ERA. In the 1885 season, Welch and Keefe reunited as a two-man pitching rotation, with Keefe having a 32-13 win-loss record. The team, now called the Giants, had an incredible record of 85 and 27, with Welch winning 17 consecutive games at one point, but finished second to the Chicago White Stockings, who finished with a record of 87-25. After the 1885 season, Welch was one of nine Giants players to form baseball's first union, which was known as the Brotherhood of Professional Base Ball Players. The players were upset about the way they had been treated by baseball owners. The reserve clause, which restricted player movement and tempered increases in player salaries, had been instituted in 1880. The union spent the next several years recruiting new members and talking about the cause of player salaries. Though Welch was still an active player, he began saving money with the goal of opening a hotel. In 1886, Welch won 33 games, which was second on the Giants to Keefe's 44 victories. Despite this win total from Welch and Keefe, the team fell to third place in the league. Though they enjoyed a 47-12 record at the Polo Grounds, they were 28-32 while on the road that year. As Keefe and Welch were so overworked by 1887, the Giants picked up young pitchers Bill George and Cannonball Titcomb, but both of them struggled and the Giants finished fourth. On September 10, 1889, he is credited as having become the first pinch hitter in major league history; he batted for Hank O'Day and struck out. Conventional wisdom indicates that this must have been an injury situation since a rule allowing pinch hitters in non-injury situations was not instituted until 1892. The first pinch hitter under that rule is generally agreed to be Jack Doyle‚ on June 7‚ 1892. The Giants won the 1889 World Series, but morale was low on the club. Relationships had become strained between players and owners across the league. The league was planning to implement a system of player ratings which would be used to determine player salaries. Welch and the other members of the Brotherhood were outraged by such a system and they began to plan a new baseball league, inviting players to join even if they were not Brotherhood members. The new eight-team league became known as the Players' League. Before the Players' League began its season in 1890, Welch realized that he was coming to the end of his playing career. Saying that he was in baseball to earn money, Welch agreed to re-sign with the Giants on a three-year contract. Welch said that he had been willing to accept $2,000 less to play in the Players' League, but that deal fell through when the league could only guarantee one year of salary. He met with sharp criticism from Jim O'Rourke and other Brotherhood members, but the Players' League lasted only one season. On April 24, 1890, with the score tied 2-2 in the 7th inning between his Giants and the Boston Beaneaters‚ Welch got into an argument with umpire McDermott, an argument that resulted in the umpire declaring the game forfeited to host Boston. With Welch and Keefe still on the same club, the 1891 New York Giants had two 300-game winners. Until the 1980s, this was the only time that a major league team featured two pitchers with 300 wins each. After one start in the 1892 season, Welch was sent to the minor leagues, earning a 16-14 record and a 0.87 ERA for the Eastern League's Troy Trojans. He retired from baseball after the season, having compiled 307 victories, 210 losses, 1850 strikeouts and a career 2.71 ERA. As of 2015, Welch ranks third on the all-time list of career wild pitches. He had unique hitting skills for a pitcher, finishing his career with a .224 batting average, 93 doubles, 16 triples and 12 home runs. In addition to his 607 games pitched, Welch made 59 career appearances as an outfielder. Author David Fleitz writes that Welch did not swear, smoke or drink hard liquor. Welch liked beer enough that he would write poems about it, reciting them for sportswriters or for fans on the carriage ride to the ballpark on game days. Sometimes his poetry also advertised local bars and restaurants. Welch and his wife Mary had nine children, two of which died in infancy. Mary died in 1936. After retiring as a player, Welch lived in Holyoke, Massachusetts. He joined an Elks lodge and remained in the organization for more than 50 years. He owned a saloon for a while and after he sold it, he went into the dairy business with one of his sons. Welch spent summers in New York. He worked as an attendant at the Polo Grounds. In a 1911 book on baseball history, Welch was described as the owner of a hotel in Troy, New York. Welch and Keefe remained friends long after they retired from baseball. He died at the age of 82 in Concord, New Hampshire. He had been staying with his grandson in Nashua when he had to be taken to a Concord hospital with congestive heart failure. He is interred in the Calvary Cemetery in Woodside, Queens, New York, under his birth name of Walsh. Welch was elected to the Baseball Hall of Fame by the Veterans Committee in 1973. He was represented at the Hall of Fame induction ceremony by his elderly daughter, Julia Weiss. 1 2 3 "Mickey Welch's career statistics". baseball-reference.com. Retrieved 2007-11-29. 1 2 3 "The Ballplayers – Mickey Welch". baseballlibrary.com. Retrieved 2007-11-29. 1 2 Fleitz, p. 29. 1 2 3 4 "The Ballplayers – Chronology". baseballlibrary.com. Retrieved 2007-11-29. ↑ "Tim Keefe's career statistics". baseball-reference.com. Retrieved 2007-11-29. ↑ "Troy Trojans History & Encyclopedia". baseball-reference.com. Retrieved 2007-11-29. ↑ "1883 New York Gothams". baseball-reference.com. Retrieved 2007-11-29. ↑ Bulkley, George (1982). "Why did Mickey smile?". Baseball Research Journal. 11. Retrieved March 25, 2015. ↑ "Sports A.M.". Bangor Daily News. May 30, 1986. Retrieved March 25, 2015. ↑ "1885 New York Giants". baseball-reference.com. Retrieved 2007-11-29. ↑ Kerr, Roy (9 September 2011). Roger Connor: Home Run King of 19th Century Baseball. McFarland. pp. 77–80. ISBN 978-0-7864-8513-0. Retrieved March 25, 2015. ↑ "Baseball notes". The Evening News. April 25, 1987. Retrieved March 25, 2015. 1 2 3 "Mickey Welch Statistics and History". Baseball-Reference.com. Retrieved March 25, 2015. ↑ "Career Leaders & Records for Wild Pitches". Baseball-Reference.com. Retrieved March 26, 2015. 1 2 3 4 Fleitz, David L. (April 3, 2007). More Ghosts in the Gallery: Another Sixteen Little-Known Greats at Cooperstown. McFarland. pp. 140–149. ISBN 978-0-7864-8062-3. Retrieved March 26, 2015. ↑ Spink, Alfred Henry (1911). The National Game. Southern Illinois University Press. p. 398. ISBN 978-0-8093-2304-3. Retrieved March 26, 2015. ↑ Hawking, James (2012). Strikeout: Baseball, Broadway and the Brotherhood in the 19th Century. Sunstone Press. p. 253. ISBN 978-0-86534-864-6. Retrieved March 26, 2015. ↑ "Mickey Walsh stats". retrosheet.org. Retrieved 2007-11-29. ↑ "Hall of Fame Biography". baseballhalloffame.org. Archived from the original on 2007-11-04. Retrieved 2007-11-29. ↑ Markusen, Bruce (March 2002). Roberto Clemente: The Great One. Sports Publishing LLC. p. 132. ISBN 978-1-58261-312-3. Retrieved March 26, 2015. Fleitz, David L. (27 February 2009). The Irish in Baseball: An Early History. McFarland. ISBN 978-0-7864-5304-7. Retrieved March 25, 2015.